Situated off Hall Road, and entered via a private driveway, lies this 2 bedroom upper conversion offering spacious and well proportioned accommodation. Accommodation comprises: Entrance hall having storage cupboards and with a broad staircase leading to upper accommodation; Downstairs shower room with electric shower, wash hand basin and plumbing for a washing machine; Upper hallways affording access to all main accommodation, shelved storage press; Good sized lounge with bay window, with seating area, to front, feature fireplace with open fire (not tested), twin timber/glazed doors give access to the dining kitchen; Large dining kitchen with ample space for table & chairs, cooker included in the sale price; Bedroom 1 lies to the rear and is a large double bedroom with views over the roof tops of Rhu; Bedroom 2 lies to the front with bay window and feature fireplace with open fire (not tested); Three piece bathroom with corner bath. The subjects benefit from gas central heating and double glazing. 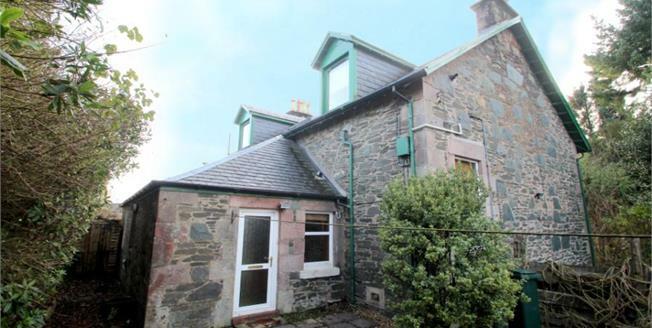 Access to the property is via a private stone-chipped driveway which provides ample parking. There is small decked area and shrub beds. Timber shed included in sale price.